Ten years ago your Uncle Vinnie gave you a wedding gift, the privilege to buy ten thousand shares of closely held stock in his great new internet start up called Linkintomyface. You are told the stock is worth ten cents a share, but by buying now for a mere $1,000, you will be making the investment of a lifetime. You have held onto the stock not knowing what to do with it, except cashing the hundred dollar dividend checks you receive each year, but you have just been informed that the company is going public with an IPO on the stock market. Great news, because based on the popularity of Linkintomyface, you are informed the initial offering price per share is going to be set at $350 a share. This means that your ten thousand shares valued at $1,000 when Uncle Vinnie sold you the shares will be worth at least $3.5 million. Again great news, you are now a millionaire, you no longer have to worry about paying your mortgage every month or funding the kids’ college education and you can buy everyone in the family a new car. With your initial investment of a $1,000 now worth several million dollars and having bills to pay and things to buy, and because it is the stock market and you never know what will happen tomorrow, you decide to sell all your stock and take the profits. You are set, no more worries about money you are ready to start living the good life, but now for the bad news the tax man cometh, and you owe the government capital gains tax on the increased value of the stock, which increased $3,499,000 in value since you bought it ten years ago. As you write out the check to the IRS you wonder if you had other options than the sale of the stock. One option, to merely cashing in your stock and paying capital gains tax, is you could make a donation of all or part of the stock to The Salvation Army in the form of a Charitable Remainder Trust. In so doing, you would save yourself on capital gains tax and potentially other taxes, while making a donation to the Salvation Army that will benefit and improve the lives of many people in your community and helping to secure your legacy, a legacy of hope in troubled and difficult times. But what is a Charitable Remainder Trust? A Charitable Remainder Trust (CRT) is a legal arrangement in which a donor gives over a piece of property or money through a donation to a charity, but the donor continues to use the property or receives an income from the asset for a set period of time, usually the donor’s lifetime. When the specified time period ends the trust property is then available for use by the charity. The benefit to the donor is that they avoid any capital gains tax on the donated assets and potentially earn an income tax deduction for the fair market value of the remainder interest the trust earned. Further, since this is an irrevocable trust the asset is removed from the donor’s estate, meaning the assets of the CRT will not be calculated into the donor’s estate for the purposed of the estate tax. Thus, the donor receives a yearly payment of income from the CRT during their lifetime, potentially reduces their tax liability significantly and makes a donation to the Salvation Army to benefit the needy in their community. So, before you cash in your shares in Linkintomyface, evaluate if there is a way to maximize the benefit you receive and benefits you can pass on to your community, by give to the Salvation Army through a Charitable Remainder Trust. If you have any questions or you would like to secure a legacy of hope by making a donation of a Charitable Remainder Trust or discuss other ways you can create such a legacy please call Tim Henry Director of Planned Giving at 314-646-3016 or email at timothy_henry@usc.salvationarmy.org. “God always comes through for me,” said Mackendy Charles a Haitian gentleman, who gave thanks to his sight first and foremost to God, and then to the doctors, and Salvation Army personnel who have twice come to his aid to save his sight. In 2006, Charles, then 21, approached Salvation Army Envoys Steve and Ketsie Diaz, while he attended the Army’s Secondary School in Port-au-Prince. His eyes had been badly damaged from a childhood bout of Tuberculosis. His eyes were gray, cloudy, badly scarred and caused him great pain. Diaz arranged for Mackendy to see a specialist, who informed him the surgery and treatment he required was not possible in Haiti, and that without a double corneal transplant, he would soon lose his sight. The specialist informed Diaz that Mackendy would have to go to the United States in order to receive proper care. “We didn’t have the funds to help him,” recalls Diaz, who told Mackendy there was nothing more they could do. Diaz did however reach out to friends in the United States – Dr. Schoults and Dr. Kiernan, an anesthesiologist and an ophthalmic surgeon, who agreed to perform Mackendy’s transplant free of charge, even getting the hospital to write off any fees. Once in the United States, Mackendy quickly received treatment and afterwards, his vision improved dramatically – going from a 6 inch field of vision to more than 6 feet in the first day. In 2009, Envoys Diaz were transferred to St. Louis, Mo., to be administrators at a community center leaving Mackendy. In 2010, a catastrophic 7.0 magnitude earthquake struck Haiti. As his vision worsen, Mackendy reached again. The doctors, hospital, and Salvation Army rose to the occasion, this time with the assistance of the South Side Lion’s Club in St. Louis, which paid for travel costs and associated fees. On Sept. 13, 2011, Mackendy returned to the states. Diaz reconnected Mackendy with his doctors, who found that he had scarring, blood vessel damage and cataract growth. On Oct. 19, 2011, Mackendy underwent surgery to remove cataracts and scar tissue, and to replace one cornea. Following his procedure, he stayed with Envoys Diaz at their home until January when he returned to Haiti. Mackendy is back in Port-au-prince living in a tent with his mother in the IDP camp next to the Army’s Delmas 2 compound. He is satisfied with the results of the operation and though he’s had a bit of irritation in his right eye, he reports his vision is better and will have his first visit with his local doctor on March 2. Mackendy is enjoying his university studies in theology and is excited to graduate in July. He still travels, and studies, with the help of his cousin and doesn’t let his vision issues slow him down one bit. He was recently appointed the director of Sunday schools for his church. He is very thankful for all the opportunities he’s been offered through the kindness of others but recognizes that God is the one who made the way. “It was God’s plan for me not to lose my eyes,” he said. Mackendy reports that his favorite thing to enjoy since his second operation is his girlfriend Melissa’s face. There are people like me who vote a mixed political ticket, love the Ramones, adore Kurt Vonnegut and Lawren Harris and worship Chris with our whole heart, yet we struggle with the church’s idea of holiness. We are supposed to “be like Jesus” even though Jesus never dealt with a computer, radio or television. We are supposed to fully consecrate ourselves to Christ and to act in his service. How does that work out in a two party system where all too often the choice seemingly comes down to morally straight or socially responsible? I’m afraid that the reason why a whole bunch of people have given up on this holiness thing is that they feel trapped between the church sanctioned ideas of purity and their own sense of good taste and ideology. Churches are full of “followers of Christ” who in frustration have given up on actually following Christ and that problem extends beyond just the music we listen to and the books that we read. At this point, some pastors would suggest that we “surrender it all.” I would rather suggest this: Stop pursuing some preconceived notion of righteousness and go on a whole-hearted pursuit of God. Romans 9: 30 – 32 “What then shall we say? That the Gentiles, who did not pursue righteousness, have obtained it, a righteousness that is by faith; but the people of Israel, who pursued the law as the way of righteousness, have not attained their goal. Why not? Because they pursued it not by faith but as if it were by works. They stumbled over the stumbling stone.” Jesus never really fit into the accepted norms of his day, perhaps the most holy of us don’t exactly fit in either. The Salvation Army continues to provide much-needed assistance to those in Branson, Missouri and Harrisburg, Illinois in response to Wednesday’s tornadoes damaging storms, standing ever-vigilant with those communities in the face of Friday’s storms. As the Branson-area disaster relief efforts progress and change, so too does The Salvation Army’s response in meeting the immediate needs of the community. Currently, The Salvation Army is focused primarily on providing food, water and spiritual care from the mobile feeding units, or canteens. Crews from Joplin and Springfield handled preparation and delivery of meals as part of a coordinated effort with the local chapter of The American Red Cross to meet local needs. On Thursday, the Salvation Army served 364 meals, 502 drinks and 679 snacks in the Branson area. At this time, additional volunteers for The Salvation Amy’s Branson-area relief efforts are not needed. However, it’s likely that many volunteers will be needed in the coming days to assist with clean-up at the Branson Corps. Work continues on the ground in Harrisburg, IL with Captain Heath Sells as the Incident Commander in this relief effort. On Thursday 506 survivors, first responders and volunteers were served with 763 drinks, 405 meals and 302 snacks. Divisional Commander Major Lonneal Richardson visited Harrisburg on Thursday, meeting with survivors to pray and provide them with grocery vouchers and other forms of assistance. The Salvation Army in Harrisburg continues to coordinate with other relief agencies and government entities to ensure the most necessary needs are met. Please remember that due to the high expense and amount of time often associated with delivering in-kind gifts, such as gently-used household items and clothing, The Salvation Army cannot guarantee at this time that any individual donated gifts-in-kind will be sent to the disaster area. During times of disaster, The Salvation Army is able to meet the need for these items from the store’s existing, pre-sorted stock. Therefore, by continuing to donate gently-used household goods to your local Salvation Army thrift store, you not only help your local community, you help us prepare for future disaster relief needs. To locate your nearest Salvation Army drop-off location, please visit http://www.satruck.org. The Salvation Army canteen was on the move prior to sunrise in Harrisburg, Illinois Thursday morning. In the wake of the Leap Day storms that tore through Kansas, Missouri and Illinois Tuesday and Wednesday, Salvation Army disaster crews responded swiftly to aid first responders and survivors in affected areas. Crews in Branson focused primarily on meeting immediate needs of those most heavily damaged areas of Branson, along Highway 76. A canteen crew provided snacks, drinks and meals to survivors, first responders and clean-up crews. A Salvation Army canteen is presently feeding those affected at the Branson Mall parking lot. Branson’s Mayor Presley visited the canteen and publicly thanked The Salvation Army for their response in the wake of the storms on her Twitter page. In Harrisburg, Illinois, approximately 100 homes – about forty percent of the city – were affected, and there were six confirmed fatalities. The Salvation Army was at work as quickly as possible in this remote area, and served hot meals at the Walmart on South Commercial Road, to first responders and those affected. Food was provided by a local school where it had already been prepared for the school day. The canteen was back in action at sunrise on Thursday morning. The city of Harrisburg has requested that The Salvation Army take charge of feeding those displaced by the storm and first responders, while the American Red Cross provides shelter. Additional efforts are being undertaken in Kimberling City, Missouri, which is dealing with a water crisis after their water distribution tower sustained significant damage. For the latest, visit www.stlsalvationarmy.org, or follow us on Twitter! 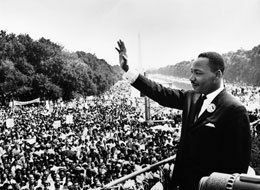 Martin Luther King Jr.’s diligence to his dream was the key that permitted him to overcome many obstacles. People opposed him from every side, yet he never looked back. He pressed forward to preach the message of equality for all, and he was fearless in making his dream a reality for everyone. We are called on to do the same, in spite of the inequalities in our communities across this nation. What we need to overcome negative forces is a prescribed amount of God’s diligence, entrenched in our lives and patterned after the diligence of Jesus who gave up his earthly freedom so that all people could have access to salvation. As “Jesus Loves the Little Children” says, “Red, yellow, black and white, we are precious in his sight.” We can all be the dream that King so wanted for every color, culture and creed. God, through Jesus and by the power of the Holy Spirit, is our freedom maker and spiritual liberator. As you live in the freedom of Christ, others might soon see your brightness and want that same God-given freedom. When my father punished me for wrongdoings as a little boy, he said that he only wanted to free me from my wrongdoing so that I would choose to do right the next time, and so that I might feel hurt inside for a little while but be set free later on by the truth. Dad was talking about freeing me from wrongdoing, but what he really wanted me to understand was that freedom comes from making a decision about what is right and wrong. For me, that included being put in time out. It might have hurt during that time, but I was free and felt better later on. Remember that it is about living each day not in fear, but in faith — that all your wrongs can be made right in Christ, if you only believe. Whom the Lord sets free is free indeed. We were inspired by a great idea from Jenni Ragland, Associate Director of the Community Relations Department at The Salvation Army Alaska Divisional Headquarters. She created a 12 Months of Giving calendar which listed a new way to give back to Alaska communities each month of the year. Want to check it out? Click Here for Jenni’s Calendar! January: The Salvation Army loves re-gifting! As you clean out to make room for gifts received at Christmas, remember The Salvation Army Family Stores need your gently used clothing, household goods or cars to support the Adult Rehabilitation Program, as well as other Salvation Army services. February: The coldest month of the year means those without coats are those with the most need. Consider sorting through your coat closet and parting with the unworn – somebody will be very thankful for your donation! With more than 12 sites in metro St. Louis, The Salvation Army can certainly find someone in need. Call us to see where you can deliver your donation at (314) 646-3018 or visit http://www.stlsalvationarmy.org to find your nearest location. March: Adult residents in Salvation Army Transitional Housing have a variety of needs based on their circumstances. Your in-kind donations certainly help them through this tough time. Common donations include: toiletries, bedding, pillows, gift certificates for food, plates, silverware, clothing and toys. April: April showers bring…well, flooding! We pray that natural disasters don’t happen, but if they do, The Salvation Army is almost always among the first to respond. By visiting our “Ways to Give” section on our website, you can designate your donation to a specific disaster campaign, helping those who are struggling in the aftermath of natural disasters. May: Give back in small ways during National Salvation Army week, May 7-13! Click here for a number of ideas as to how you can “Do the Most Good” for everyone in your life during this week and beyond. June: Send a kid to camp! Salvation Army summer camps offer fresh air, exercise and new friendships to children from low-income families. By donating $175, you can ensure a fun-filled week of sports, camping, arts & crafts, music development and many more adventures, for someone who would otherwise miss out. July: Donate food! With school out for the summer, we see an increased number of families that need food assistance at Salvation Army food pantries. Help stock our shelves by organizing a canned food drive. August: It’s back-to-school time! Help disadvantaged children in your community return to school with the right tools for success and confidence in the classroom. Donations include school supplies, backpacks and clothes. Find out what your local Salvation Army needs and then hit up the store to help out a local family in need! September: School has officially started and Salvation Army afterschool programs will be looking for tutors and volunteers! Lend a couple hours after school, an ear and a helping hand to a child in need. October: There are many homeless families enrolled in Salvation Army Family Service programs and who reside in temporary or long-term housing because of financial struggles. Consider lifting their spirits through gifts or basic necessities. November: Ensure a disadvantaged child or senior experiences Christmas joy by adopting an angel through The Salvation Army’s Angel Giving Tree program. December: Donate your spare change and say Merry Christmas to your local Red Kettle bell ringer! Interested in volunteering your time? Sign up as a volunteer bell ringer through your local Salvation Army unit. Reposted from Salvation Army USA blog. The best meal of the day… and a brilliant fundraiser! As part of our series on unique and fun fundraiser ideas that supporters can take on to support The Salvation Army all year ’round, we turn to the best meal of the day… breakfast! Ice Cream for Breakfast: Partner with a local ice cream shop or host the event in your church’s fellowship hall. Offer DIY ice cream sundaes for breakfast with a variety of breakfast-themed toppings! Maple syrup ice cream with crispy bacon on top, waffle cones made with real waffles! Have a photo booth set up where people can take pictures with their ice cream creations and hand out prizes for most creative concoctions. Breakfast with __________: This perennial theme is popular for a reason – it’s highly attended and those who attend often make it an annual tradition. Serve up breakfast fare of choice with Santa, the Easter bunny, or the whole crew from Sesame Street! Reach out to your local costume store for character options. You can also use this as an opportunity for breakfast with a local celebrity or the mayor. Sell tickets, take pictures and have fun while sharing the work of The Salvation Army. Envelope Breakfast: Find a local chain restaurant with a busy breakfast seating and get their permission to set out envelopes that say, “Please support the work of The Salvation Army in Missouri and Southern Illinois by donating generously during this Envelope Breakfast.” Waitresses or managers can check the envelope after each seating and deliver donations at the end of the shift. This can be done for one meal or all day, depending on the wishes of the restaurant. Breakfast with the CEO: Auction off a breakfast with your company’s CEO to employees, vendors and the general public. You can go as simple as an internal memo, and as big as a press release, depending on how well known your CEO may be. Social media is an easy promotion vehicle as well! The only out-of-pocket cost for this event is breakfast! If you, your family, business or organization decide to plan one of these events, email Danni Eickenhorst at Danielle_Eickenhorst@usc.salvationarmy.org and The Salvation Army will be happy to promote your event. Thank you for your support!